I think there's a lack of Italian samples. The other one was way better for me though. 1 50% British +50% Greek_Smyrna @ 1.988042 Smyrna ??? That place doesn't even exist anymore after the Turks burned down the place forcing the Greeks to flee to other parts of Greece. Last edited by Dimanto; 09-12-2014 at 06:25 PM. 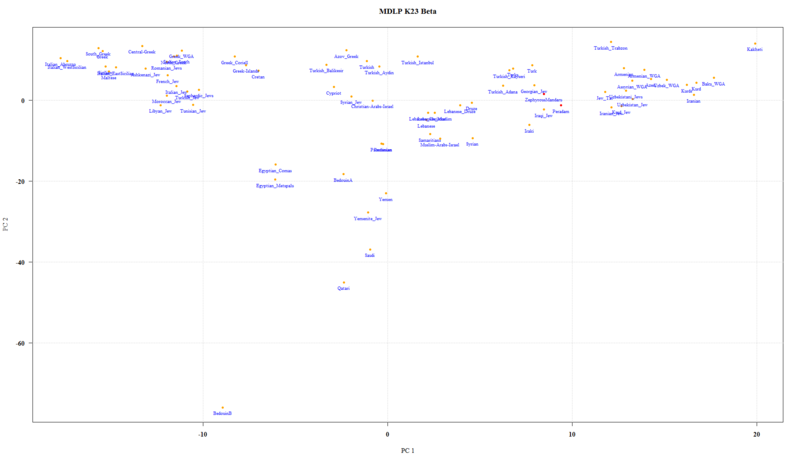 Peradam created an MDS Plot based on MDLP K23b, not bad for a first try. Last edited by Rukha; 09-13-2014 at 12:19 AM. where is south-central asia, altaic and archaic_human ? Last edited by vettor; 09-12-2014 at 11:56 PM.